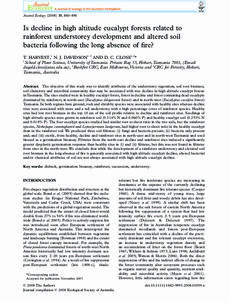 eCite - Is decline in high altitude eucalypt forests related to rainforest understorey development and altered soil bacteria following the long absence of fire? The objective of this study was to identify attributes of the understorey vegetation, soil root biomass, soil chemistry and microbial community that may be associated with tree decline in high altitude eucalypt forests in Tasmania. The sites studied were in healthy eucalypt forest, forest in decline and forest containing dead eucalypts dominated by rainforest, in north-east (Eucalyptus delegatensis forest) and in north-west (Eucalyptus coccifera forest) Tasmania. In both regions bare ground, rock and shrubby species were associated with healthy sites whereas decline sites were associated with moss and a tall understorey with a high percentage cover of rainforest species. Healthy sites had low root biomass in the top 10 cm of the soil profile relative to decline and rainforest sites. Seedlings of high altitude species were grown in rainforest soil (0.314% N and 0.060% P) and healthy eucalypt soil (0.253% N and 0.018% P). The four eucalypt species studied had similar root to shoot ratio in the two soils, but the rainforest species, Nothofagus cunninghamii and Leptospermum lanigerum, had higher root to shoot ratio in the healthy eucalypt than in the rainforest soil. We produced three soil filtrates: (i) fungi and bacteria present; (ii) bacteria only present and; and (iii) sterile, from healthy, decline and rainforest sites in north-east and in north-west Tasmania and used linseed as a germination bioassay. Filtrates from the north-east decline and rainforest sites induced a significantly greater dysplastic germination response than healthy sites in (i) and (ii) filtrates, but this was not found in filtrates from sites in the north-west. We conclude that while the development of a rainforest understorey and elevated soil root biomass in the long absence of fire is generally associated with high altitude eucalypt decline, altered bacterial and/or chemical attributes of soil are not always associated with high altitude eucalypt decline.